A 16-year-old boy has suffered "life-threatening injuries" following a reported city centre hammer attack. 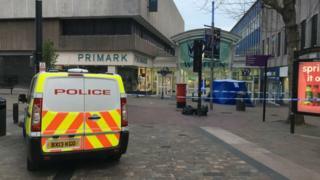 Police received reports of a teen being hit with a hammer at Wulfrun Square in Wolverhampton at about 16:30 BST. The boy has been hospitalised and his injuries are believed to be life threatening, West Midlands Police said. A spokesperson said investigations are ongoing and CCTV footage is being reviewed. Detectives are appealing for information.